This vintage style necklace features a replica of the historic map created by Baptista Boazio depicting Sir Francis Drake's West Indian Voyage from 1585-1586. The portion of the map used for the pendant is an image of a fish. The original map was hand-drawn and colored in beautiful blues and golds. The map replica is set in a circular antiqued 24 K (plated) gold pendant tray. 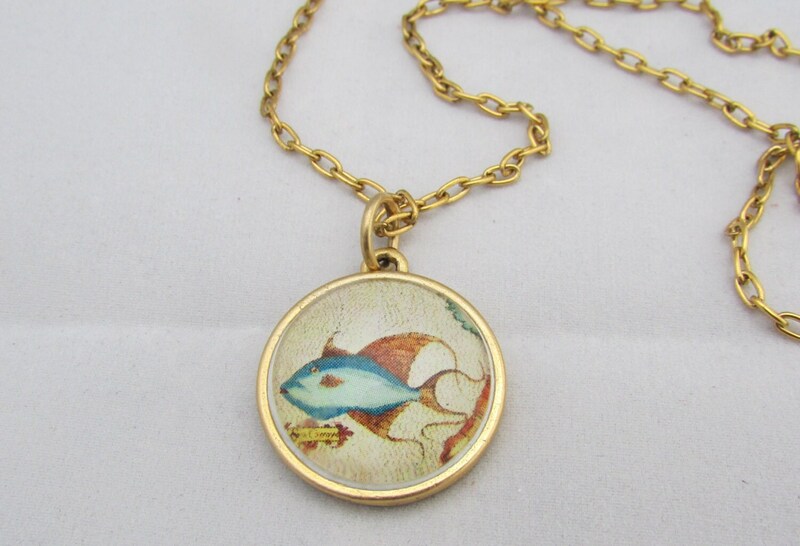 The pendant measures approximately 0.75 inches across and hangs from an 18 inch gold plated chain with a hook and eye clasp. The finished glass cabochon is domed shaped and magnifies the beautiful blue fish image. This map image is also available for a custom order.